U.S. Senator Mark Begich/YouTube; KTUU-TVAlaskans will vote for either Democrat Mark Begich, left, or Republican Mike Dunleavy for governor on Nov. 6, which will determine what’s next for the Alaska Permanent Fund. The Alaska Permanent Fund is a $US65 billion fund managed by a state-owned corporation and fuelled by oil and gas revenues. The fund was created in 1976 and began giving an annual dividend to every Alaskan – ranging from roughly $US1,000 to $US2,000 – in 1982. Current governor Bill Walker lost popularity for his decision to cut the dividend, and his soon-to-be-decided successor will determine the fate of the program. For the last 36 years, the majority of Alaskans have received an annual check of about $US1,000 to $US2,000 as part of the state’s ambitious and unique permanent fund. And when they choose their next governor on Nov. 6, they will be deciding the $US65 billion fund’s fate. While an annual, no-strings attached check from the government sounds like it would come from the left, it was actually developed by a Republican governor, Jay Hammond. Since then, it’s had overwhelming bipartisan support. Current governor and independent Bill Walker’s cuts to the dividend were highly unpopular – this year’s dividend was $US1,600 per person, but the Associated Press reported the original payout was going to be $US2,980 (that’s $US6,400 versus $US11,920 for a family of four). Walker backed out of his bid for re-election in October, giving his support to Democratic candidate former US senator Mark Begich, when all polls showed neither had a chance against the Republican on the ballot: former state senator Mike Dunleavy. The latest polls have Dunleavy leading, but not by much. 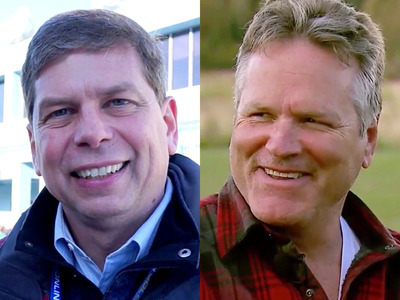 Begich and Dunleavy are trying to win Alaskans’ trust during a recession that saw the loss of thousands of oil and construction jobs and brought the state’s unemployment rate to the highest in the nation. An issue both candidates agree is crucial to winning back trust in the state is how to strengthen the Alaska Permanent Fund dividend and ensure its long-term value. For some background on this unusual situation: The United States purchased Alaska from Russia in 1867, but did not adopt it as a state until 1959. Part of being admitted as a state was the ability to be self-reliant, and that was first accomplished by having the highest personal income tax in the country – self-reliance became significantly easier when the Trans-Alaska Pipeline System was completed in 1977 and soon brought in billions of dollars in revenue from those who pumped and shipped the state’s freshly tapped oil reserves. Ahead of the pipeline’s completion, Gov. Hammond decided to put the incoming money into a fund that would strengthen the long-term success of the young state and reduce the tax burden on its citizens. This led to the creation of the state-owned but otherwise independent Alaska Permanent Fund Corporation a few years later. The APFC would manage the fund money as a single body, but make it accessible to the state in a corpus that could only be touched with the voted consent of Alaskans, and the earnings reserve, which could be adjusted as necessary with popular support from the legislature. The state then decided in 1982 that a portion of the reserve would be paid out each year to eligible Alaskans, tied to the performance of the fund. Eligibility requires registration, but there is no age limit or income restraint. That means in a year with a $US2,000 payment, a family of four receives $US8,000. It became essential to Alaskans in all walks of life, and it may be correlated to the state’s leading the country in lack of income inequality. So when Gov. Walker decided that cutting the dividend to allocate more of the fund’s earnings reserve to the government would help during the state’s current recession, citizens were not happy. “I believe my plan is the only plan that guarantees a sustainable PFD while also protecting the fund and its future from politicians down the line,” Begich said on his website. Dunleavy thinks his more hands-off approach is the more sustainable one. “We should leave it alone and not attempt to ‘fix it,'” he said in a statement to Business Insider.